Post Tagged with: "Vacation Destinations"
Where are the top Mexico beach vacation destinations? This is an easy question to answer, particularly if you like to take vacations in Mexico as there are some top Mexico beach vacation destinations that stand out from the rest. The top Mexico beach vacation destinations by most standards are Cabo San Lucas, Puerto Vallarta, Riviera Nayarit, Cancun and Loreto. These top locations are famed for glorious sunshine throughout the year, stunning beaches, a great selection of activities, top hotels and incredible geographical surroundings. What they also boast is an international airport making getting to and from these destinations all the more easy. 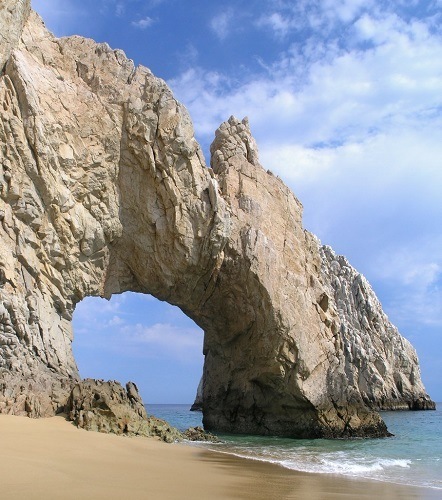 At the very tip of Baja California you will find the delightful Mexico beach vacation destination of Cabo San Lucas. This location is perfect for all kinds of vacations, from romantic getaways to Spring Break party-time. It has such a variety of activities, resorts, restaurants and bars that Cabo San Lucas can match any beach vacation expectation. The dry heat and the amazing beaches make for a wonderful relaxing vacation in the sun with the option of a variety of activities from fishing, golf, whale watching, surfing, off-road ATVs, banana boats, parasailing and the like. On the opposite side of Mexico to Cabo on the Caribbean coast, Cancun is always present in any list of top Mexico beach vacation destinations. Cancun is like the jewel in Mexico’s crown of beach destinations with its Caribbean setting and historical Mayan ruins. Cancun is a unique beach vacation destination in that you can enjoy all the Mexican traditions, including food, music and ancient cultures while relaxing on idyllic white sandy beaches framed by turquoise Caribbean ocean. The nightlife in Cancun is also very popular as there are many top bars and nightclubs to keep you dancing till dawn, even a pirate ship show on the Jolly Roger. On the Pacific Coast of Mexico, Puerto Vallarta and Riviera Nayarit (Nuevo Vallarta, Bucerias, Punta Mita) awaits with a typically Mexican experience. Puerto Vallarta retains its colorful Mexican charm with balconies overflowing with bugambilia and terracotta rooftops. The shape of Banderas Bay also provides stunning horizons and sunsets and you feel like you are nestled within the arms of mother nature. The Pacific playground offers a host of different activities including zip line adventures in the mountains, whale watching, the Marigalante pirate ship, skydiving, surfing and more. One of Mexico’s best kept secrets, Loreto deserves to be on the top Mexico beach vacation destinations list. The Islands of Loreto form a natural marine reserve where diving and snorkeling are a must for visitors. You can even rent glass bottom kayaks. The destination is perfect for a romantic retreat or leisurely vacation where being at one with nature is your priority. The town of Loreto also makes for a delightful saunter as you explore the Mission Church and the quaint town square.